Storycorps presents it's first half hour special, animated by the Rauch brothers. It will air on PBS stations on Thanksgiving night, but check your local listings. From what I can see, the Buffalo affiliate, WNED, will not be running this, so Toronto is out of luck. Greg Kelly has pointed out to me that starting November 29 until December 28, the special will be online at PBS, so everyone will get a chance to see it. Thanks Greg. While he has seemingly retired from directing animation, Hayao Miyazaki has returned to creating manga. Above are two photos of many from a recent Japanese documentary on Miyazaki, as reported by Crunchyroll. The manga is a period piece dealing with samurai during the Warring States period of Japanese history. 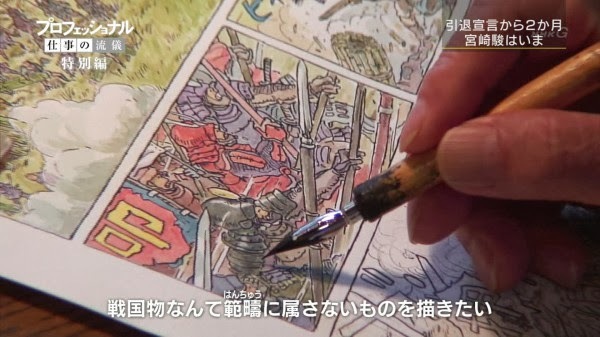 Miyazaki already created one major manga work, Nausicaa and the Valley of the Wind. Having read and admired that, I look forward to reading more Miyazaki when this is completed. 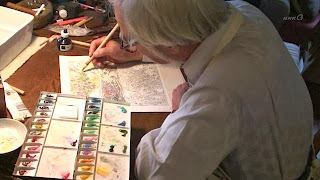 The always interesting film blog Greenbriar Picture Shows has an entry on the work that Milt Kahl did prior to starting at Disney. He did advertising art for the Fox cinemas on the west coast of the U.S. One of the ads pictured has a 'K' signature in the corner, making it highly likely it's Kahl's work. Somebody tell Andreas Deja about this. My admiration for Pocoyo, especially the first season, is a matter of record. 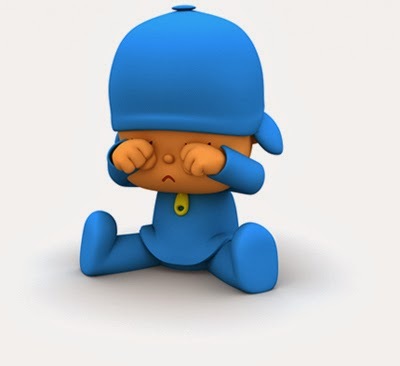 I was sorry to hear that Zinkia, the company that produces Pocoyo, is now seeking bankruptcy protection. I have no idea if this was due to circumstances beyond the company's control or if there was mismanagement involved, but in any case it's a shame. I hope the company is able to restructure and survive. There's not a lot of contemporary animation that I look forward to, but I'm always excited to see a new short by the Rauch brothers. So much of contemporary animation is devoid of real human feeling and emotion. It relies on dramatic and comic clichés and the dialogue is straight from sitcoms. It is refreshing to see some animation, like the above, built on genuine human experience. I have no idea if these shorts are creating any ripples within the animation community, but they should be. The Rauch brothers are pointing in a direction that animation needs to go, and it doesn't need $150 million budgets to get there. All it needs is truth and taste, two things that should be in good supply and that won't break the bank. This short is one of four new Rauch brothers shorts that will be included in the November 28 POV special on PBS. I look forward to them all. You can see all of the Rauch brothers shorts for StoryCorps here.